Darragh O'Conaill Interview: Emotional Victories and the Growth of Irish Jiu Jitsu! As one of Europe's premier stockists of rash guards and BJJ shorts for NoGi, we only stock the best of the best. All of our rash guards are made using only the highest quality spandex, nylon or polyester materials. Giving you greater protection against rashes caused by abrasion during fights. We stock rash guards for both men and women from some of the most recognised brands including Manto, Scramble, Moya Brand, Kingz and many more. We offer free shipping throughout Europe and next day delivery in the UK. Rash guards are designed to wick moisture away from the body, ensuring you stay as cool and dry as possible. 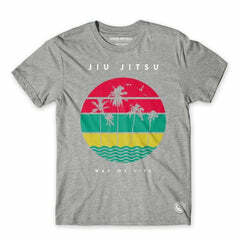 Wearing a BJJ rash guard helps minimise ‘mat burn’, protecting skin on the chest, back and arms when you’re on the mat. Rash guards are much better suited for grappling training, unlike regular t-shirts they are lightweight and stretch without tearing, they’re also designed to be difficult for opponents to grab onto. Our MMA rash guards are available in both long and short sleeve styles in a range of colours and prints, we also offer a selection of 100% legal ranked rash guards for IBJJF competition. Shop the full range at Fighters Market EU today. Sign up and receive 5000 pts to test out in our Store.